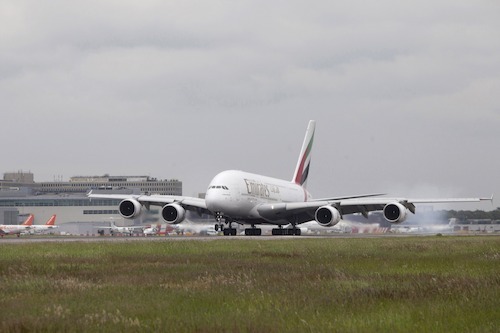 DUBAI, U.A.E., 16 April 2015: Emirates, a global connector of people, places and economies, has launched a second daily A380 service to London Gatwick Airport. Due to passenger demand, Emirates has taken the decision to immediately upgrade its EK15/16 route that was previously operated by a Boeing 777. The A380 will add a total of 318 seats per day increasing capacity in all three classes by 11.5 percent. Over 330,000 customers have already flown with the A380 to and from London Gatwick since the aircraft was first deployed in March 2014. The introduction of a second daily Emirates A380 to London Gatwick is expected to help facilitate increased trade from key destinations in West Asia, Australia, Africa, the Middle East and Far East. Leisure travellers will also benefit from the additional capacity which has been introduced well in time for the UK summer. London Gatwick Airport offers excellent connections to the South East and central London – in fact with the Gatwick Express travellers can conveniently reach London Victoria station in only 30 minutes. The Emirates A380 offers spacious seating in Economy Class, access to the world’s only onboard Shower Spas for First Class passengers and the Onboard Lounge where First Class and Business Class passengers can socialise at 40,000 feet. Passengers throughout all classes can also enjoy access to over 2,000 channels of films, TV shows, music and games through ice, the airline’s award-winning inflight entertainment system as well as free wifi connectivity and gourmet cuisine. As with all Emirates flights, passengers will benefit from a generous baggage allowance of 30kg in Economy Class, 40kg in Business Class and 50kg in First Class. Emirates flight EK15 will depart Dubai International Airport at 0800hrs and arrive in London Gatwick at 1230hrs. The outbound flight, EK16, will depart London Gatwick Airport at 1425hrs and arrive in Dubai at 0025hrs.